Domestic thriller writer Sara Foster returns in 2016 with her fourth novel, which might just be her best yet, though it would be a close call between this novel and her second, Beneath the Shadows. All That is Lost Between Us is the story of Anya, a school counsellor at a prestigious Lake District school in the UK, and her daughter Georgia who is a budding champion fell-runner. Georgia has a secret, but when a car accident puts her cousin in the hospital, the entire family is forced to realise that sometimes keeping secrets can do more harm than good. The story is told in a multitude of voices; Georgia, her brother Zac, her father Callum, and Anya, though it is only Anya's parts which are told in first person. While it is Georgia whose actions set a lot of the plot into motion, it is Anya who is the driving personality behind the story, and who lends her perspective to the themes surrounding motherhood which are developed throughout the plot. Anya's job as a counsellor means that she is responsible for the mental well being of a number of students, but this can sometimes mean that she is distant from what is going on in her own family. When the central crisis of the book kicks off, everyone begins to realise just how much they have drifted, particularly Anya and Callum whose relationship has cooled to the point of both people feeling like the other is a stranger. Callum's volunteer job as a member of a rescue team means he also has a great deal of responsibility to others, but his job also involves long hours and an element of danger. The danger comes not only from the elements but from Danielle, a woman he feels attracted to from the moment she joins his team. Though Callum and Danielle both acknowledge that there is something between them, the accidental which puts his niece in the hospital and threatens his daughter shows Callum that he needs to fight his way back to the family. But is is the voice of Zac which is most compelling. A teenage boy, a typical little brother, Zac spends a lot of his time playing video games with friends, and feels the pressure of not being particularly cool. He is a compassionate character, and the accident and subsequent worry everyone begins to feel about Georgia weighs on Zac. When he discovers something that might expose Georgia's secret, Zac becomes a central player in how the story will resolve itself, but I will let the reader find out just how for themselves. This book is a real page turner, and it gets the moments of tension just right. In the hands of a less skilled writer, perhaps the novel might have strayed into melodrama, but Foster has kept a stern control of her moments of tension, leaving the story beautifully paced and impossible to put down. There were a few loose ends, such as the looming presence of the man whose son Callum rescues on the fells, but they didn't detract from the story too much. I really enjoyed this book and devoured it in a day. I gave it four and a half stars. 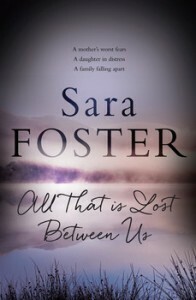 You can meet Sara Foster at an event at the Bookcaffe in Swanbourne on Tuesday the 9th of February 2015. For more details, see the event page. I enjoyed this book a great deal despite not being a genre I read often. I loved the character development and the fact that Anya's perspective was written in the first person. I rated it 4 1/2 stars as well.